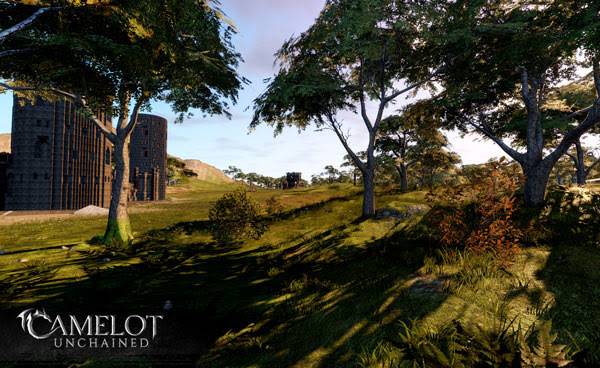 Welcome to the start of a new year for Camelot Unchained! We had a short three-day week here at CSE after coming back from our holiday break. That, however, didn’t stop us from immediately spinning up all-day testing each day this week on our new siege scenario. While this is still very much a work in progress, it’s been awesome to see players deploy siege engines against our fully destructible castle while its defenders scrambled to keep the walls up! Watching towers crumble and fall, sometimes in wacky ways, was always entertaining! While siege may be our immediate focus, we have plenty of work ahead of us this year, and a fully capable, hard-working team to tackle it. We’re looking forward to the journey with you, our ever-supportive Backers, to help us make 2019 epic! If you missed this week’s livestream with Mark, you can find that HERE. Even though it was a short week, we still accomplished quite a bit, as can be seen in this week’s Top Tenish! 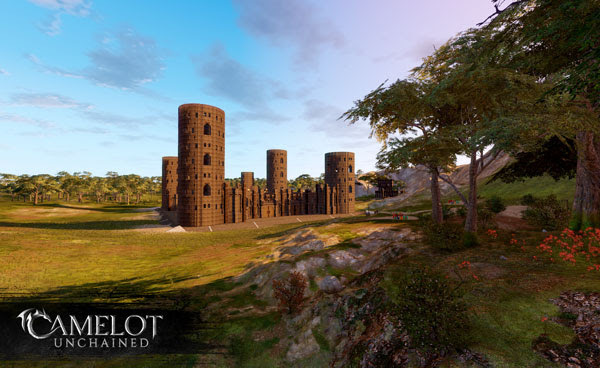 Tech – Three full days of testing: We welcomed our Backers back into Camelot Unchained with three full days of testing from Wednesday to today. Many scenarios were played, bugs were found, fun was had! In other words: lots of progress as lots of new Backers had their first look at V0.1 of our Saturday Night Siege scenario. As discussed in items 2 and 3 below, lots of changes are incoming as I type this. WIP – Tech – Building Destruction Improvements: Andrew just dropped in several changes amounting to, in his words, “Big progress on breaking apart buildings and minimizing weird/strange behavior.” In other words, we hoped you enjoyed our “bouncy castles,” as they won’t be around much longer. WIP – Art/Design – New Siege Scenario Test Map: Ben and Tyler created a new siege scenario test map, far less barren than the current test map. While this map is not indicative of a final scenario, it’s much prettier to look at, and helps test performance with a more verdant landscape. 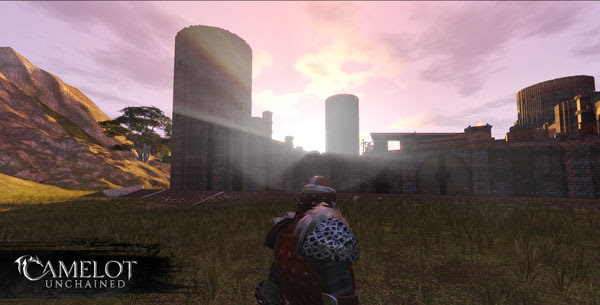 WIP – Tech – Lighting FX: George greatly improved upon the visual quality of our god rays (light shafts). He added a lens flare as well, and both of these are currently on Hatchery. If you have access…go stare into the sun?! For example, you’ll see the effect when the sun is low and some trees are between you and the sun. Being a first pass, it’s still a WIP–if you can get the time of day and your position just right, you can make it look like laser beams are shooting out of your eyes! WIP – Tech – Crafting UI: The totally new crafting UI is moving along nicely. AJ has an iteration in review, with plenty of fixes. He’s closing in on finishing this iteration, and we hope to get it in the hands of testers soon! Tech – Platypus Export/Import functionality: Platypus is an internal tool we use to spin up a client and server locally. This new functionality allows users to create an “egg” file which another user can import, allowing Platypus to preconfigure the environment with the binaries provided by the creator. We will use this first to begin testing all the character and animation 2.0 work on a local artist machine. This means we can find and fix issues before pushing it all over to master so we don’t interrupt testing during the process. Item DB Upgrades: Christina finished up some work to ensure we don’t get any more “angry Mongo slowdowns” like we had right before the break. Passive Alert System and WIP Building Mode Material Replacement: JB added functionality for sending passive alert messages from the game server to the client. This will be used for displaying alert text on screen for gameplay notifications. Although it’s still waiting on a bug fix, he’ll also be adding an interface for material replacement in building mode, which will help the builders work faster. WIP – Art – Siege Engine – Trebuchet: Scott updated the Trebuchet to use a separate rock model for ammo, similar to how we show arrows in character hands with archery abilities. Mike is working on improvements to the VFX to make sieges a bit more exciting, and Michelle will begin concepting Realm variations of the current model. WIP – Two-Handed Sword: Sandra began work on updated animations that allow us to share the animations amongst all classes and races. This also supports future animation system work that will display the ability system timing changes better. WIP – Mage Shared Casting: Scott is animating the secondary skirt and cape animations on our mage casting animations. Scorpion Animations: Scott updated the player’s paired scorpion animations to the new skeleton. Luchorpán rigging: Joe began working with the new Luchorpán skeleton and meshes this week. This is one of the last steps to complete the update of the existing races. Having a unique skeleton that mirrors their different proportions will further differentiate them visually. 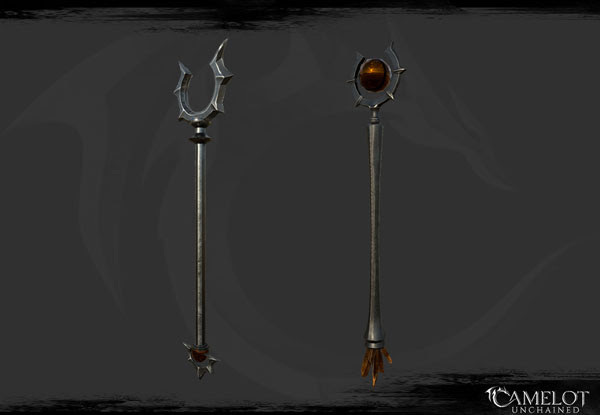 Female NPCs and Flame Warden Wands: Jon finished the 2.0 update to three female NPC outfits and created two of the Flame Warden’s wands. WIP – Design – New Classes: Ben continued work on the shapeshifting classes this week, and is chomping at the bit to begin working with the in-progress ability editor, which will speed up ability creation. WIP – Support Class Skill Icons: This week, James finished off the Minstrel icons and has begun work on the Dark Fool! Getting some of the required UI assets done early will make it easier to get the new classes in, once those are built. Like I said, we got a lot done in only three days! 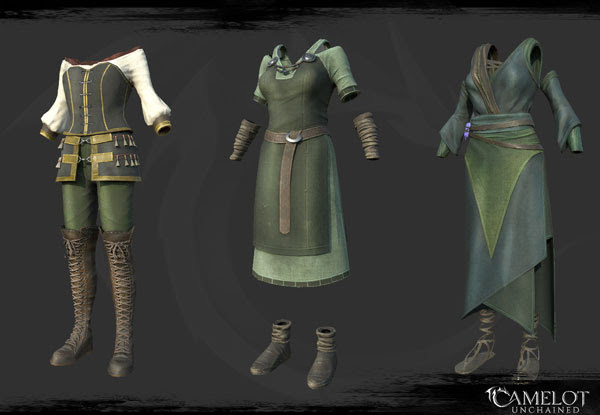 For art this week, we start with some of Jon’s work on the three female NPC outfits. These have been updated to work with the 2.0 update of the character art, and will next go to Dionne and myself, Tyler, to create the armor parts and LODs. Here’s a couple of the new wand models Jon created. These things are just itching for some epic VFX from Mike! 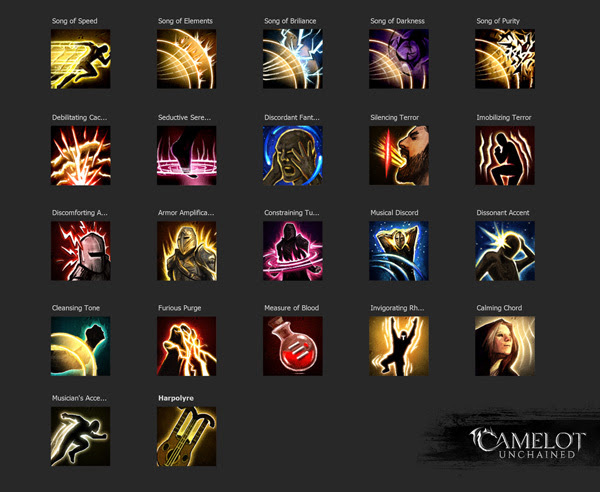 James, as mentioned above, is quickly churning out skill icons for the new class abilities. Michelle jumps in to help out for the particularly difficult ones. We had a conversation earlier about how you visually show speeding up and slowing down musical tempo. Of course, all of these will get further iterations based on player feedback. 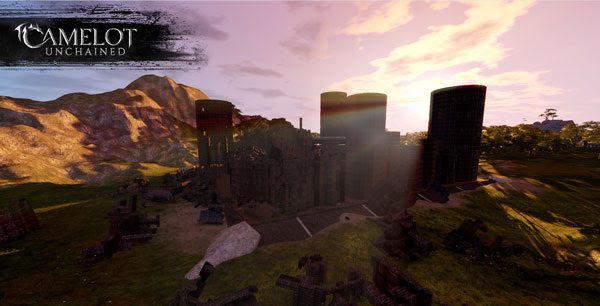 Let’s take a look at some of the environment art in the new siege scenario test map. This is a work-in-progress, and not indicative of what the final siege scenario zone will look like, but it lets us further test performance in a more realistic environment. This will replace our quickly-built “desert” map we initially began testing on at the end of last year. One of the members of our Builder’s Brigade was kind enough to build this castle for us on short notice, complete with extra-tall towers to test destruction and rubble! Just look at that delicious open ground around the castle itching for a couple scorpion or trebuchet siege engines! Come join us for further testing next week! Here’s a shot of the updated god rays and lens flare courtesy of George. And then the Tim’ening happened! Thanks a lot Tim! To end things off, we have some beautiful work from Michelle, celebrating the new year. Full confession here, I totally forgot to include this in our last update of December. Michelle, after delivering a bit of scolding I fully deserved, gave it a bit of a New Year vibe for this week’s update! On that note, I can say with confidence that we’ve come back from our holiday break, refreshed and ready to tackle the new year! 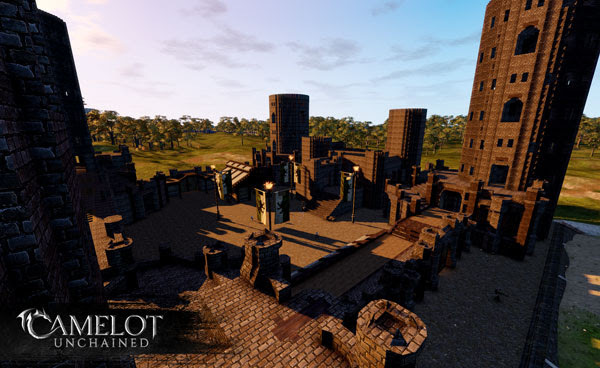 We’re all excited to continue work on all the new features, especially siege-style scenarios, as well as new races, classes, fireballs, and the epic battles to come!